We are Michael and Oksana from Helicopter Ears, where with many wonderful supporters we’ve been rescuing special-needs rabbits since 2011. 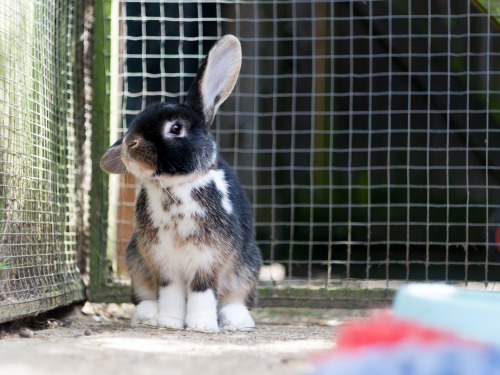 You’ve fundraised incredible amounts, and together, we’ve made miracles for rabbits who had no hope. But it’s not enough. This never will be enough. If we saved every rabbit today, we’d be back to where we started before the shops close tomorrow. We are fighting a losing battle. We must confront the cause of the problem. And we need your support on Patreon to do it. So why Patreon when we have Facebook? Good question. Imagine a zoo. Free entry, cute animals, free bunny cuddles, free pet advice … Free pets? Well, not quite. While everyone is welcome, some drop a banknote into a tin, some a thank-you note, but most don’t take note of the tin. It’s a noisy, busy place, and those special few we should be talking to because they care enough to help us run it and want to help more, they can’t get a word in, and we can’t thank them, because we can’t tell them apart from the rest. On Facebook, we can’t say a lot. In fact, there is more we can’t say there than we can. And we want to tell so much more than we do in our carefully edited posts because we need to hear what you have to say. On Facebook, we are losing touch with you. Patreon is a community for our active supporters only. You can meet each other, we can get to know you, and you, us. Talk to us directly, go behind-the-scenes, get previews of our upcoming books, be part of the cause you care about. Join us! Let’s stand up to bad shop and bad breeders. Let’s make it a better world for all the bunnies, not just those at Helicopter Ears. Let’s tell everyone, together, just how important rabbits are! Please see our website for answers for all your Patreon question and why your support here is so important to us. If you wish to join the warren, consider yourself in! Get access to patron-only posts, news and updates, behind-the-scenes videos, bunnies' live feeds, and other exclusive content. Over a year, a monthly pledge of the cost of a cup of coffee covers a trip to our exotic vet. And whenever we're off, you’re there with us, in the car. WOW! Plus, you get access to our patron-exclusive content, too. WOW! You must really love our work—and now, you can also contribute! There can never be too much bun-xpertise, right? You will get previews of our books, articles, and videos, so be sure to hop in often and let us know what you think. You may, of course, simply donate, but if that’s your kind of turf, dig right in. Your commitment to bunny welfare is truly admirable. As well as getting all of the above, you will be the first to hear about our plans, ideas, and any conundrums we face, and if you happen to have expertise, experience, or just want to share your opinion, we will hear it, whether it's a pat on the head or a thump up our tail. You will be able to get right through to us (we'll message you with the details). Consider yourself on our Bunny Advisory Board—and don’t be shy! This brings tears to our eyes. Your belief in us and faith in the bunny cause can only be likened to our desire to not disappoint: there’s nothing you wish for more than putting an end to the hardships rabbits have endured. And though you probably want nothing in return, we want to give you something special. How about a copy of our book? You’ll get a mention, for sure! What you deserve is a medal. You're a Bunny Champion, after all. We can’t believe anyone is even reading this. We can’t believe this is even a level! This would be a tremendous contribution and a massive boost to both our cause and our confidence in it. You simply must come over. Meet all the rabbits. Have a cup of tea. We want to give you a big bun-hug—both to thank you and to make sure we haven’t imagined you.